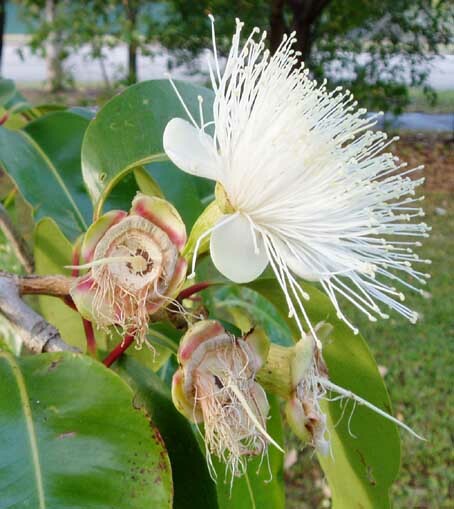 Syzygium suborbiculare is an evergreen tree growing between 10 and 14 metres found throughout tropical Australia and Papua New Guinea. 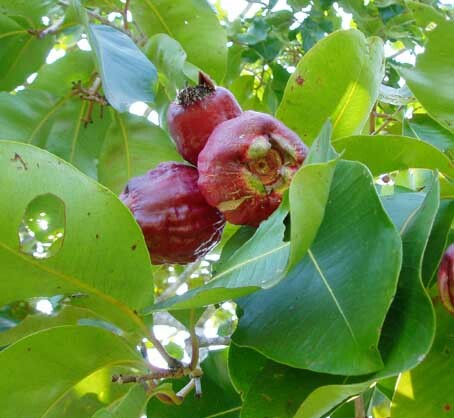 Previously known as Eugenia suborbicularis and commonly as Red Bush Apple. It is common through savannah woodland and on the edge of coastal floodplain growing in sandy soil. 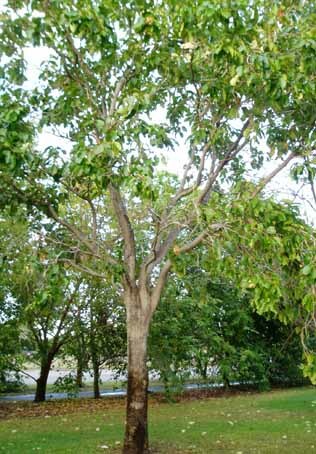 Samples growing in coastal dunes on Melville Island differ in having dull leaves, smooth white fruit with a pinkish blush. The photographs here are taken of an example growing alongside MacMillan road in Anula in September and October 2005. S. suborbiculare may be mistaken for S. eucalyptoides subsp. 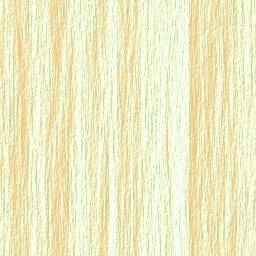 bleeseri. 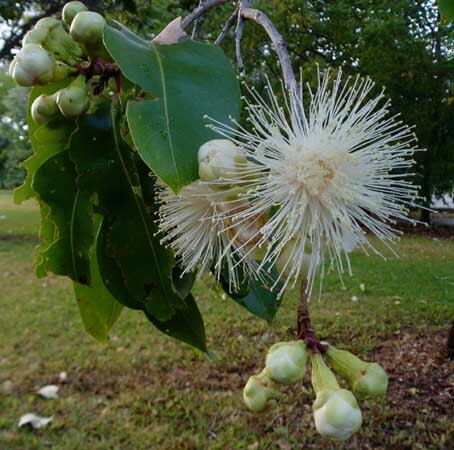 Terminal inflorescence comprise a cluster of large showy flower with numerous white stamens. Nectar from the flowers attracts bees. Globular fleshy, red fruit are up to 70 mm in length, fruiting occurs November to December. The fruit contains a single large seed. infusion form bark and leaves for stomach pains and bathe sores. The tree is fire tolerant and will shoot from lignotubers following damage from fire like other Myrtacaea. It is a good firewood. 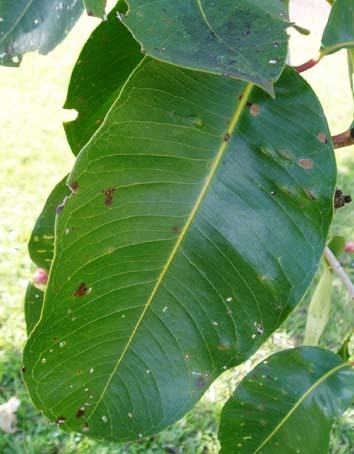 Broad, elliptical leaves are discolorous with a shiny green upper surface, paler underneath. These examples show evidence of insect grazing. Leaves are opposite, thick and leathery. 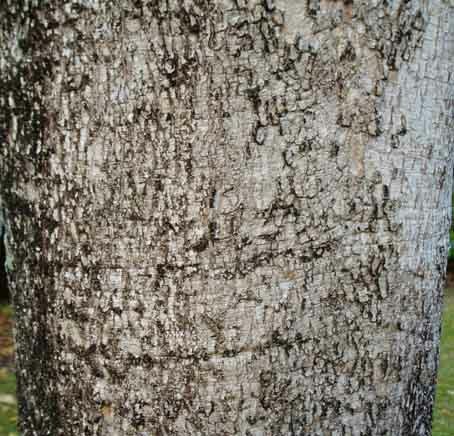 Venations are prominent with oil dots. Most have short pointed tips.